Cotswold Country House in Rendcomb, near Cirencester, Gloucestershire - peaceful tranquil and yet only 7miles to Cirencester 10 to Cheltenham and 12 to the race course. 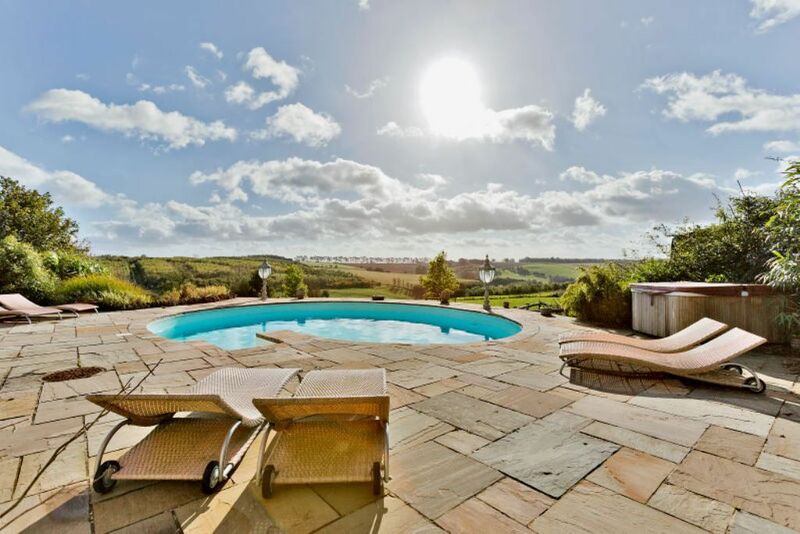 Perched high above a valley this manor house style property in mellow Cotswold stone has glorious uninterrupted views over the surrounding countryside. Welcoming and relaxed it is perfect for a house party of family and friends and offers peace and serenity whilst only a mile from a pretty village. It has 5 double bedrooms all with en-suite facilities sleeping 10 with an additional 2 on pull out beds. Maximum 12 guests. Outside there is a lovely terrace with an outdoor pool and sunloungers, plus a hard tennis court, which makes it an ideal summer getaway whilst the numerous open fires and wood burner ensure a warm cosiness in the winter. Basket of logs per fire supplied. Large gas BBQ. We also have a private caterer, who by prior arrangement can have a meal ready for your arrival, or a dinner party during your stay, a relaxing dinner in your own country house minus the washing up! Please ask about week day breaks and special offers. Perfect for people who can get away in the week. Location location location The most beautiful valley in the Cotswolds, stunning sunsets amazing dawn big big sky's, Paradise for nature lovers, spot Deer, badgers, barn owls, stoats, listen to the hedgehogs grunting in the complete silence of the valley, walkers love the valley and all the walks around us The Monarchs Way is a favourite as is the walk to our local pub across fields woods and valleys, the friendly Seven Tuns is a welcome site. If you feel too tired to walk back we have a friendly local taxi driver to bring you home. Although we are isolated we are only 10 minutes from Cirencester and 15 minutes to Cheltenham, the M4 is 20 minutes M5 15minutes. We have a small private airfield nearby if you would like to fly in, we can arrange pickups from Kemble station. We guarantee you will feel relaxed when you leave, our guests love the tranquillity and perfect beauty of the valley, the interesting places to go and see, The Cotswolds is steeped in history culture and architecture. We can plan your break for you or just help you decide on one of the wonderful local restaurants. You can sit in our sumptuous sitting room and choose a book from our extensive library, musicians can entertain on the grand piano, nature watch, use our binoculars.Walk in the rain, dry your boots by the fire, and then soak in one of the jucuzzi baths this is home from home for you and your friends. Entrance hall with open fire, dining and library area with crystal chandeliers. Drawing Room with large open fireplace, grand piano and luxurious seating. Kitchen with wood burner fire and four oven Aga. Further seating along with breakfast bar and dining table. The kitchen is fully equipped! Conservatory off the kitchen area. The dinning room is a large room with antique table and chairs surrounded by the library. Cirencester Golf Club four miles away. Notes on accommodation: Please note we are insured for no more than twelve guests. Outside: Outside we have several terraces, a swimming pool, hard tennis court all set in two and a half acres of beautiful gardens. Utility Room: Utility area with washing facilities.Washing machine, tumble dryer and butlers sink. Cloakroom. Cleaning / Towels / Linen / Maid service: All linen and towels provided, we can organise a midweek clean. Other: Dogs welcome at our discretion, please confirm your request prior to arrival. A very nice property, with plenty of room, nicely located and great views from every room. Thank you for taking the time to post a review, it was a pleasure having you and your party to stay and we hope to see you again one day. Absolutely beautiful house in an idyllic location in the Cotswolds, a perfect way to celebrate a birthday weekend away with my friends. The house itself and the grounds surrounding it is beautiful - the views are amazing! We made full use of the kitchen on both nights including the aga which was perfect and easy to cook on. Each bedroom has an en suite with a shower or jacuzzi bath and they are a generous size. Plenty of room for 11 people. One thing to note is that even though the capacity is 12 guests, there are only 5 double beds so you have to pay additional for the extra single beds. We would definitely visit again but maybe in the summer so we can make the most of the pool. Thank you Joan! Thank you for your review, we are really pleased you all enjoyed yourselves. Hope to see you again soon. Thank you for your review, we are very pleased you enjoyed your stay. Your feed back has been noted, thank you. There are the Aga toasters as well as the four slice electric toaster. I will point this out to future guests. Thank you once again it was lovely having you to stay. We really enjoyed our stay at the property. We loved the interior design, cosiness, homeliness and attention to detail. The outside space is beautiful, as well as the views and the walks to be had straight out of the door. Thoroughly recommended. Thank you for your review, we are really pleased you all enjoyed yourselves and hope to see you again soon. Stunning location ! Superb views by day and breathtaking starry skies by night. We celebrated our 50th Wedding Anniversary with our children and their children. The house fitted us perfectly. We loved the fact we all had en-suites and we made full use of the heated pool, tennis court, petanque lawn and the choice of dining locations inside and outside the house. The nights of star gazing were a bonus - a side effect of the location with no light pollution and the perfect weather we enjoyed. Our resident musician enjoyed playing the grand piano so we had a sound-track of live music in the background. We did visit the local pubs and towns too ! An unforgetable stay ! Many thanks to Joan for making it all possible. Thank you so much for such a lovely review. It makes us all so happy when people enjoy the whole experience. We are only sad that you didn't get to see the deer with her fawn. It was a pleasure to have you all stay. Perfect weather, lovely house, great for our large family. Thank you for taking the time to write a review. It was a pleasure meeting you and your family, and thank you for leaving the house perfectly clean and tidy, very kind. We can organise cookery courses, printing fabric, Deer stalking, bicycles, clay pigeon shooting, walking breaks, water skiing, wing walking, riding, beauty treatments, if there is anything else let us know. We are only 20 minutes away from Cheltenham racecourse. 10 minutes to the old Roman town of Cirencester. There is also all kinds of sports at the water park nearby. The house sits in an area of outstanding natural beauty in the heart of the Cotswolds. Our nearest coast is around one and a half hours away. Birmingham airport 45 miles Bristol 50 miles Heathrow 90 miles. Cheltenham 9 miles Cirencester 7 miles London 100 miles Oxford 45 miles. Cheltenham and Cirencester have everything you could ever wish for including regular farmers markets. Both a must to visit if in the Cotswolds.